When I read the book the first time I thought it was really harsh and going to be really hard to explain to Charlie when she did show up again. If I was Charlie I would be ticked whenever Bella did return. When I read it the second time, I saw her logic a little more. It was the only way that she knew how to get him not to try to stop her or come after her. I think Edward and Alice are VERY intuned to eachother, I don't know if that is just because both of them have powers that are similar in that they happen with their minds or what. I'm not sure the exact reasons, but it is just very obvious that Edward and Alice are very close in a non romantic way. She will always be close to Jasper of course, but she may be closer to Edward, just the best of best friends kind of thing. I think because he is very intrigued by Dr Cullen's philosophy and he is struck by the fact that the Cullen's had a human with them and they are able to coexist with humans so well. I think he also feels a bit guilty or ashamed because he had wanted the interaction between them and the Cullen's to be somewhat amicable and now everything is a mess. I think he wants to learn more about the lifestyle and that's why he goes to Denali. I think I was surprised because up until this point we had heard very little from Jasper, he didn't contribute much or say much. He was very "shy" almost, even though I know that's not exactly what it was. I thought it showed a lot because he was closing the distance between himself and Bella just a little bit by talking to her about her feelings. I think Jasper came to his conclusion because he is able to feel Edward's feelings both when he is around and Bella and when he is not. I am sure he experienced quite a bit of Edward's feelings as he came to terms with his love for Bella. He felt how strong they are. So he obviously knows that Edward thinks its worth it. I think the other part of it is what Alice talks about in the hotel later. I think Jasper, and everyone else in the family have felt the feelings of true love with their mate and they want Edward to be able to finally feel that, so she's worth it to all of them as well. Since he is also intune with Bella's other feelings he probably sees her joy and struggles and possibly just thinks she's a good person for this. I don't think she had much of a choice. She was in a hurry and had to come up with something fast. She didn't have time to stand around and argue with him or try to convince him. She had to stop him in his tracks and get out of there. I know that she hurt him badly and she felt awful about doing it but she did what she had to do to save him. Sometimes we hurt the ones we love. I was sure that Charlie would forgive her if she saw him again. They are very close, like a real brother and sister. 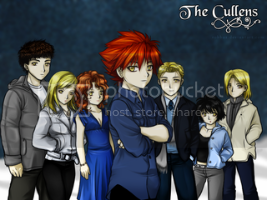 I think they have a deeper connection than any of the other Cullens (excluding couples of course). Edward feels that he can trust Alice. He seemed honestly curious about the Cullens' lifestyle. After hearing the way he talked about James, I felt that he didn't have any strong emotional ties to his coven. He was in awe of James but that wasn't enough to make him risk his life for him. 4. Were you surprised that Jasper could felt that Bella was worth it. What do you think lead him to that conclusion? I was just surprised to hear from Jasper because up until this point we hadn't gotten much of an insight into his character. I felt like I was getting to view him for the very first time instead of having to hear about him from other characters. I really warmed up to Jasper at this point. He could have just sent calming waves at Bella but that doesn't last, instead he told her she was worth it and that's something she can always remember and feel good about. I believe that he feels she is worth it because she completes Edward. The whole family has been wanting Edward to find somebody who makes him happy and now he finally has that. Nobody wants to see him lose Bella. Jasper also struggles the most with this thirst. He has to work the hardest to control it. I think that part of how he deals with it is to really humanize people, meaning he delves deeper into their emotions as only he can to find reasons to restrain himself. Because of his connection to human emotion, he may value humans more than some of the others. I think she did go too far. The way she hurt Charlie pained me inside and I always have a hard time getting past that scene without having tears in my eyes and thinking of how poor Charlie pretty much got stabbed in the back. I think she could have been a little less drastic even in that moment of flight. Being the different ones under an already different species has really brought them together to the point that they really are brother and sister and not just saying so for a cover up. When you think of Emmett and Edward, Jasper and Edward, Rosalie and Edward, there just isn't that same connection. They love each other but not like Edward and Alice. They are a crutch for the other: Alice supports Edward with her visions and Edward supports her with his mind reading, causing them to have a better chance of watching each others backs and ensuring the other that their loved ones (Jasper and Bella, respectively) are doing fine and there is nothing to worry about presently. In general, a stronger bond to the point of true sibling loyalty. I'd have to say it was just the fear of being killed by the Cullens and saying that he'd go to the Denali would help keep him on the right side of the coven. If they believed that he was going to convert himself - and miles away at that - they wouldn't see him as a threat to Bella and therefor ensuring his life. I was more surprised that Jasper spoke directly to Bella instead of just mutely following the others without a word edge wise. What led him to that conclusion is rather obvious to me: He felt how furiously the others wanted to protect her, a mere human, from other vampires leading him to the conclusion that she had worth, even though she weak and defenseless, she had a purpose. I think that she did go too far. But really it was probably the only way she would be able to get out of the house. Her father probably wouldnt have just let her go. That they have a pretty close relationship. He didnt want to be killed. He knew that the Cullens would probably fight to save bella from being harmed in anyway. And he didnt want to be a part of that. He can probably feel Edwards emotions. I mean thats what he does right? He can feel peoples emotions and change them. Well, he must know how important she is to Edward. You know, I do think she went too far. I'm sure, had she just wrenched her arm out of Charlie's grasp, he would have let her go. It would have been that simple, and she never would have had to say those words that cut him so deeply. They're clearly very close and have a very good understanding on each other. I think Edward knows that Alice is very smart and clever, and is right the majority of the time, and knows when to calm the hell down and listen to her. Alice knows he will, knows how to reason with him, and I'm sure if she got a little angry, he could do the same for her. They truly are brother and sister. He chose it out of pure cowardice. He's spineless. I was surprised at first, but after learning something more about Jasper, I'm not anymore. Since he's known Edward, I'm sure he's known (Maybe better than Edward himself) that something was missing in Edward's life... that it was somewhat empty. And we all know he is affected by the emotions, he is forced to feel them too. I think that when he got a whiff (haha) of how Edward was feeling once he found Bella, there was no question about it: Bella was worth it, because Edward said so. Oh yeah she went to far! Poor Charlie, she could've said please give me some time to think away from here and I'm sure he would've let her go. Alice and Edward are really close, Emmett and Edward are pretty close too but Alice is more rational where Emmett tends to make jokes out of everything. Alice probably closest to him because even in their world they are freaks. He didn't want to fight the Cullens probably afraid. He could feel how Edward felt about Bella, and he knew it was the way he felt about Alice, and he also knew that Alice loved Bella and he would never do anything to hurt Alice and he would never intentionally rip Edwards heart out either. I think that hurt me almost as much as it did Bella and Charlie. That they are super close. This is the closest relationship Edward has in his family. She knows how to talk sense into him. He didn't have a death wish and he's not suicidal, that's what fighting the Cullens would have meant. No, he would know how Edward, Alice and maybe even Charlie and Renee felt about her. 4. Were you surprised that Jasper could feel that Bella was worth it? What do you think lead him to that conclusion? Jasper is the MAN! Woo! That boy can feel anything! lol Besides that, Jasper knows Edward inside and out. He knows that Edward cares just as much for Bella as she does him. He let her on his conclusion because he knows how much Edward would hurt to lose her. Such a sweetheart, isn't he? She does go a little too far. It was harsh, but she did it to save Charlie. I think anyone would rather hurt someone than let them get killed because of you. They are super close. They were together first. They've known each other longer than any of the other Cullens. He knows theres going to be trouble and he doesn't want to be involved in it. Well, no. He can feel emotions..he knows what Bella means to Edward because of his emotions. I think if we all could "read" emotions we would know too.